Media playback apps often present additional content such as legal text, content warnings, or advertisements alongside their main media content. The best solution to present this kind of content is to use HTTP Live Streaming support for serving stitched playlists separated with EXT-X-DISCONTINUITY tags (see Example Playlist Files for use with HTTP Live Streaming). Stitched playlists let you combine multiple media playlists into a single, unified playlist that's delivered to the client as a single stream. This stream provides a smooth playback experience to users with no breaks or stutters in the action when the interstitial content is presented. AVKit in tvOS simplifies working with interstitial content delivered as part of a stitched playlist. You define the time ranges in your presentation that contain interstitial content. As the time ranges are traversed during playback, you receive callbacks when they begin and end, giving you the opportunity to enforce business rules or capture analytics. 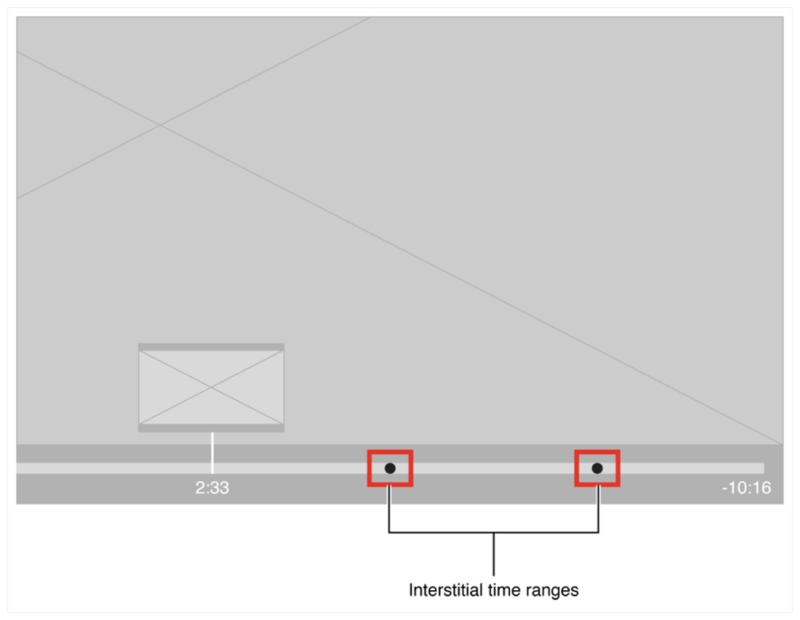 When interstitial time ranges are defined, AVPlayerViewController updates its user interface in two important ways (see Figure 1). First, any interstitial times ranges are represented as small dots on the player’s timeline. This makes it easy for users to understand where they are between interstitial breaks and helps orient them to where they are in your app. Second, the interstitial time ranges are collapsed from the player’s interface. The current time and duration presented represent only your main content, providing a better sense of the timing of the main app. The player interface’s collapsing of time ranges is only visual. Any programmatic operations you perform, such as seeking, are done on the full asset timeline, inclusive of interstitial content. For any forward seeks, the example code ensures that the user can’t skip past an ad break. It attempts to find an interstitial time range within the time range of the user’s seek request. If an interstitial time range is found, the code returns its start time, forcing playback to begin at the start of the advertisement.